John and Sherry Petersik of the design blog Young House Love recently teamed up with the VCU basketball team and Children's Hospital of Richmond at VCU to spread cheer to children who will be spending the holidays in the hospital. 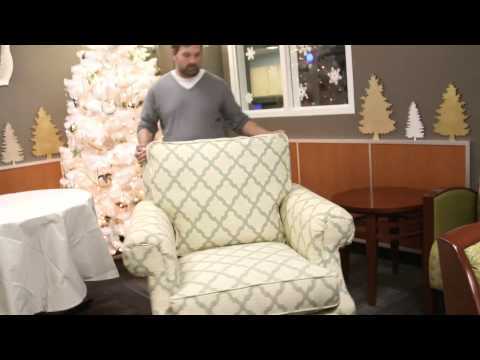 Young House Love, using their design and do-it-yourself talents, transformed the Children's Hospital family waiting room with fresh paint and fabric, while also decorating the room for the holidays. The result is a cozy space for kids and their families to feel a little more at home during the holidays. Young House Love was kind enough to share their redesign process with us. R•Home: How did you transform the family care center and living room, keeping with the hospital’s standards while also warming up the space and making it a more cozy environment? Young House Love: We were invited to help with a very special project: decorating a family waiting room at the Children’s Hospital of Richmond at VCU. They contacted us in the hopes that we could volunteer our time to warm up the room so it’s more cozy and homey year-round, as well as to add some festive touches for the holiday season. Not only did it sound like a fun project, it had such a deserving purpose that we couldn’t wait to get started. There were definitely some unique challenges when it came to keeping with the hospital's standards ... but we love a challenge! So rules about avoiding certain materials, being mindful of fire code, and working around items that had to stay just made us to think a bit harder than we might when decorating our own home. But we love where we ended up! R•Home: Did you change the color scheme or overall décor of the room? Or just add little touches?Young House Love: We set our sights on giving the space a living room-like feeling for all of the children, parents, and staff that are spending the holidays at the hospital. The existing furniture had to stay, but one major change was a new paint color, "Gargoyle" by Benjamin Moore. It was inspired by staff members who requested something enveloping and cozy, since so many other rooms there are bright and clinical. Adding touches like a cozy armchair next to a glowing Christmas tree, some soft window treatments, and a bunch of holiday additions (like a little "forest" of wooden trees around one side of the room) helped bring in more of that homey vibe too. R•Home: What kind of holiday décor are you incorporating to spread cheer? Young House Love is known for being hands-on. I imagine you both are incorporating a few do-it-yourself projects and décor as well.Young House Love: We had a lot of fun creating special touches to make the room feel more homey, cozy, and even a bit handmade. We painted a faux fire on a weathered gray plank of wood with real logs at the base to mimic the look of a fireplace. Hanging stockings above it on the makeshift mantel completed the look. We also made paper ornaments for the children in the hospital to color to create a personalized and meaningful garland across one wall. And we built things like a chalkboard for everyone to write holiday wishes on, and hung the word PEACE on the wall — which we painted in a blue gradient — just because we thought that was a fitting word for these families during the holidays. One of our favorite elements were two cork boards we painted white and used to display letters that our blog readers sent from around the world. That was the most heartwarming detail in the whole room by far! We got letters from Australia, The UK, Switzerland, Germany, Denmark, France, New Zealand and beyond — each one sending warm holiday wishes to everyone spending this season in the hospital. And it was amazing to watch the families and staff stand in front of those boards and just soak up all those loving words. R•Home: How long did it take you to execute the transformation?Young House Love: We spent about four weeks planning, doing projects loading everything into the room, and adding those finishing touches. It was so much fun to see things come together in the end, especially since it was a completely new environment for us, so it was more exciting and novel than working on things at our own home. And of course the feeling that we got when we saw the the families' and staffs' faces ... that was the best reward by far! R•Home: Did your daughter give any input on what the kids would enjoy in the family care center?Young House Love: Clara had a lot of fun with this project too! She colored some ornaments for our garland, which other children in the hospital took part in decorating as well. And she gave us a lot of ideas for the room in general, like picking some fun shatterproof ornaments for the tree — like little mittens and pine cones and owls. To read more about the transformation and see more detailed photographs, read Young House Love's Comfort & Joy blog post here.